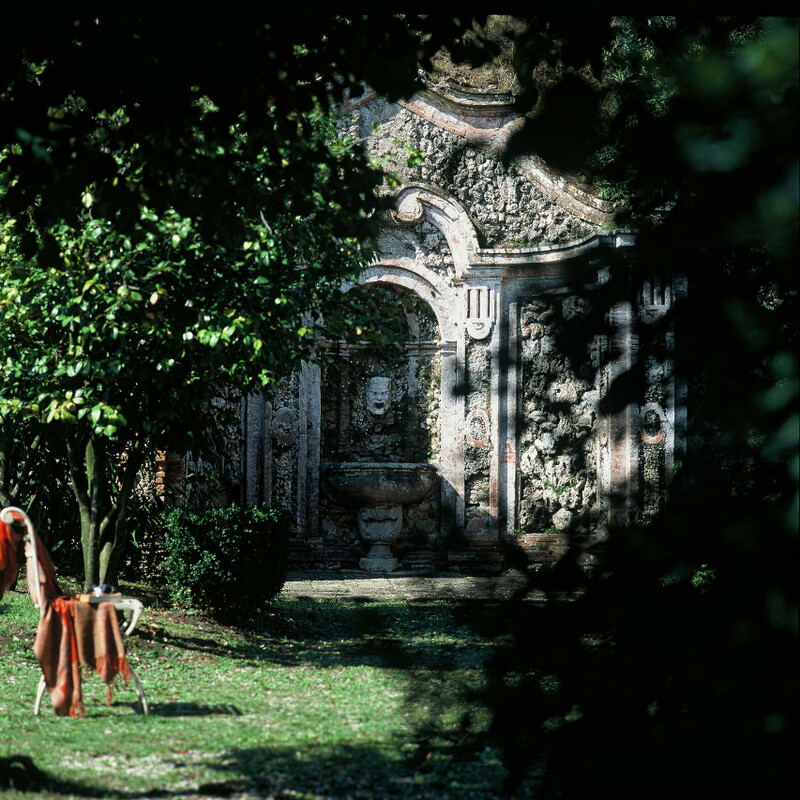 Just 6km from Lucca,the Villa has fresco painted walls and is surrounded by olive groves. Our guests will enjoy amazing views, keeping fit by the poolside gym, have dinner in the stunning alfresco dining area. 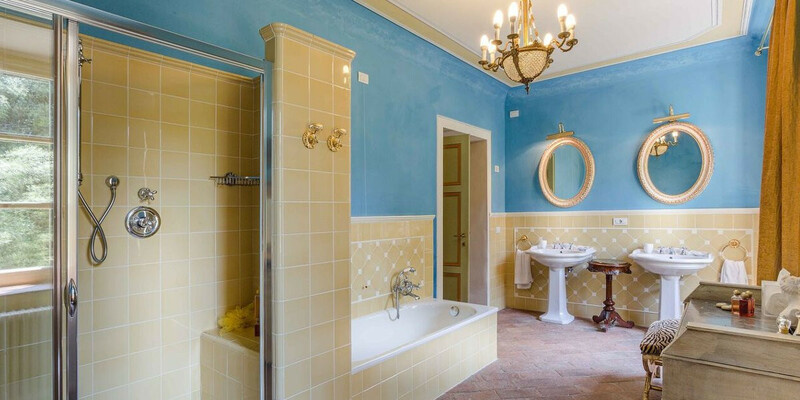 There are 11 frescoed bedrooms with en-suite bathroom. 4 extra beds are available at extra charge. 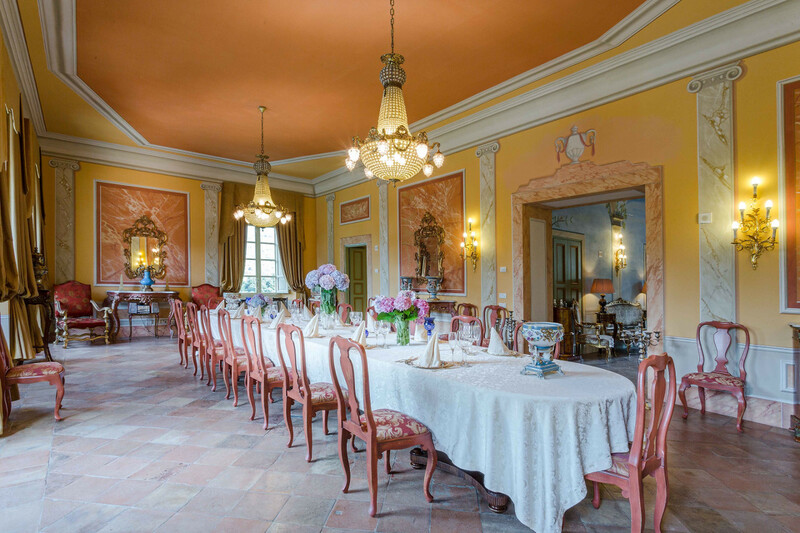 The villa offers an impressive dining room, a living room with Sat-tv, a laundry room,a furnished kitchen, a billiards. Airconditioning & WIFI available. 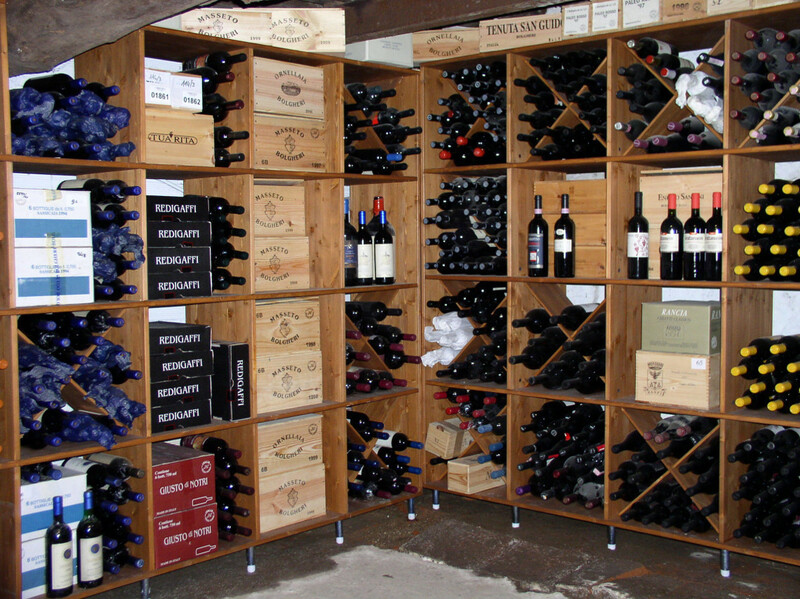 Personal chef and maid service included. 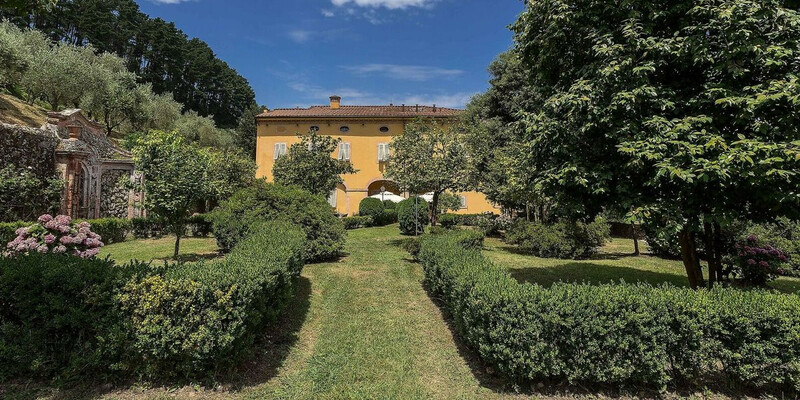 Built as the summer residence of the important family Controni, noble merchants of Lucca, during the centuries the house has hosted many famous personalities, such as the Prince Frederick of Denmark and Norway. 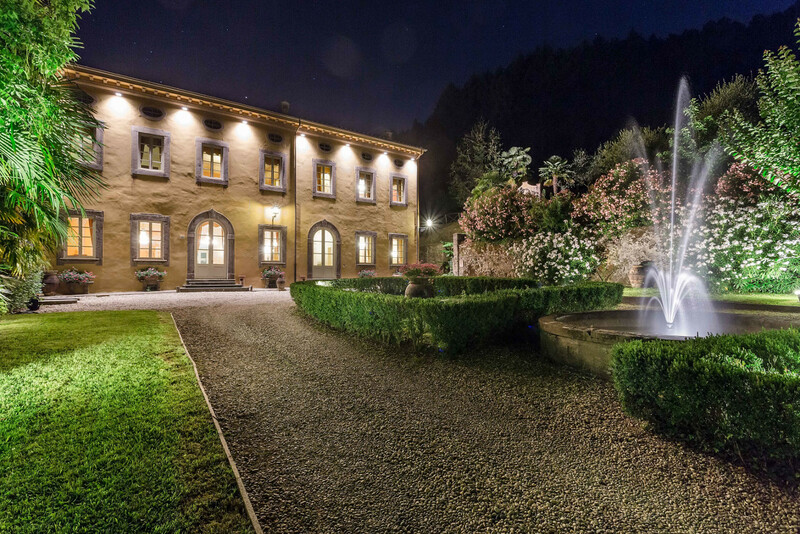 Located in a beautiful estate in the hills of Vorno, at the foot of Mount Pisano, this magnificent Villa has beautiful fresco painted walls and is surrounded by centuries old trees, olive groves and pine forest hilltops with castle ruins. 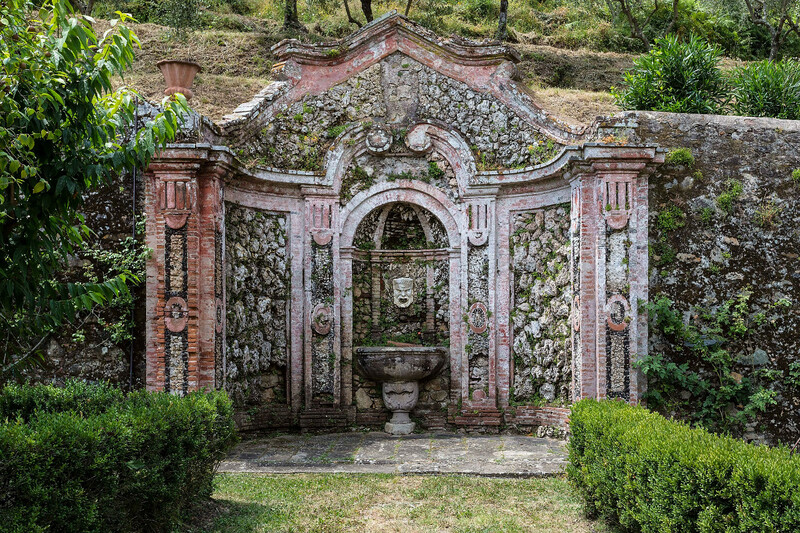 It has a small deconsecrated church where the famous Luigi Matteucci was buried, a diplomat of the Granduca of Tuscany in France and father of Felice Matteucci, the inventor of the first stroke engine. 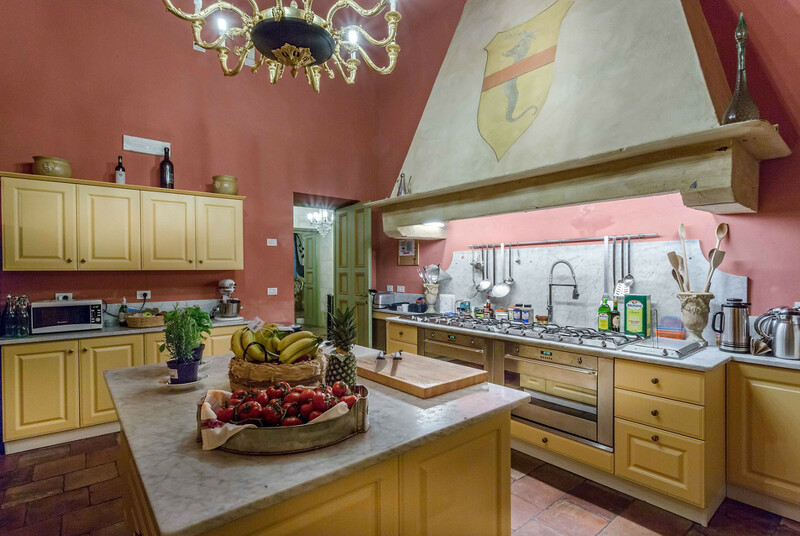 For many years the fertile estate has been devoted to the cultivation of rare flowers and to the production of extra virgin olive oil but nowadays it is a relax heaven in the middle of the Tuscan countryside. 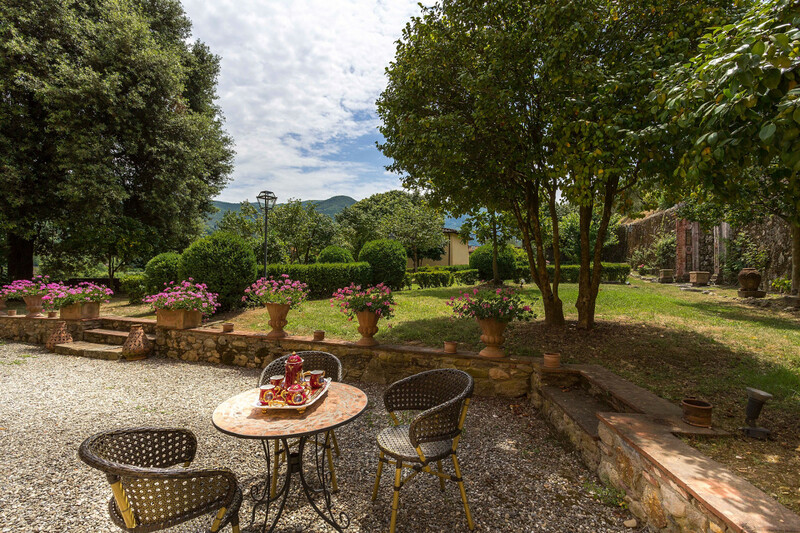 At short distance from the ancient town of Lucca, the Villa benefits from a very nice location in the hills with breathtaking views over the surrounding countryside. 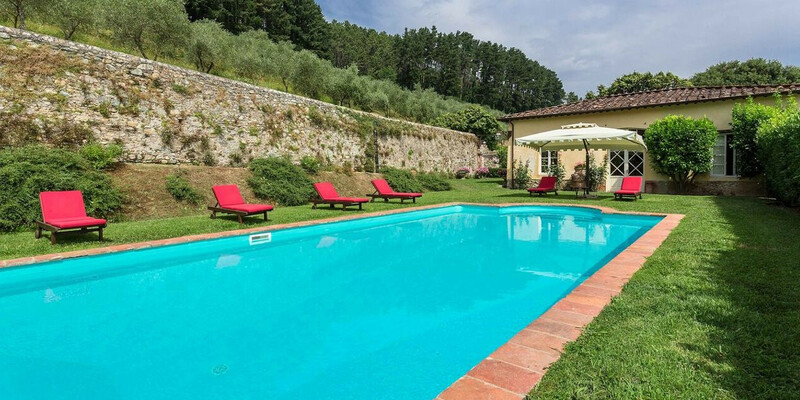 Our guests will enjoy this amazing panorama taking advantage of the peacefulness of the Tuscan countryside by the swimming pool area with sun loungers and deck chairs. 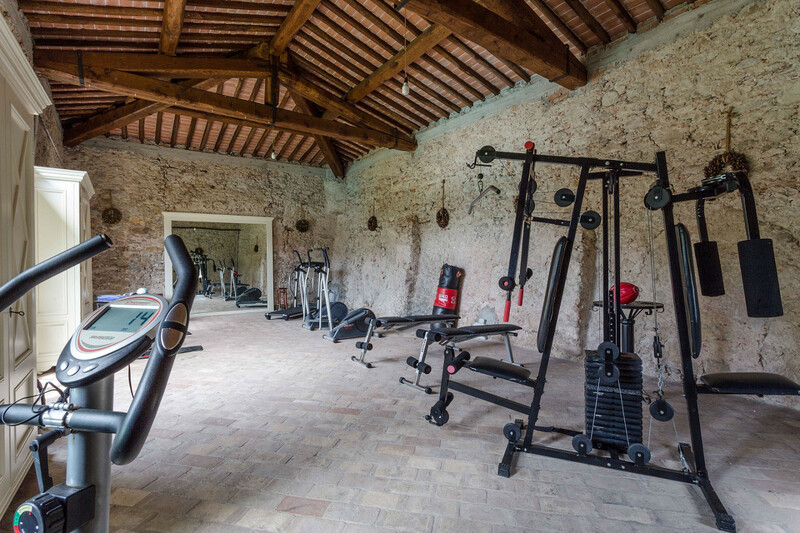 The former lemon house has been restored and converted to a fitness area with beautiful big windows overlooking the pool. 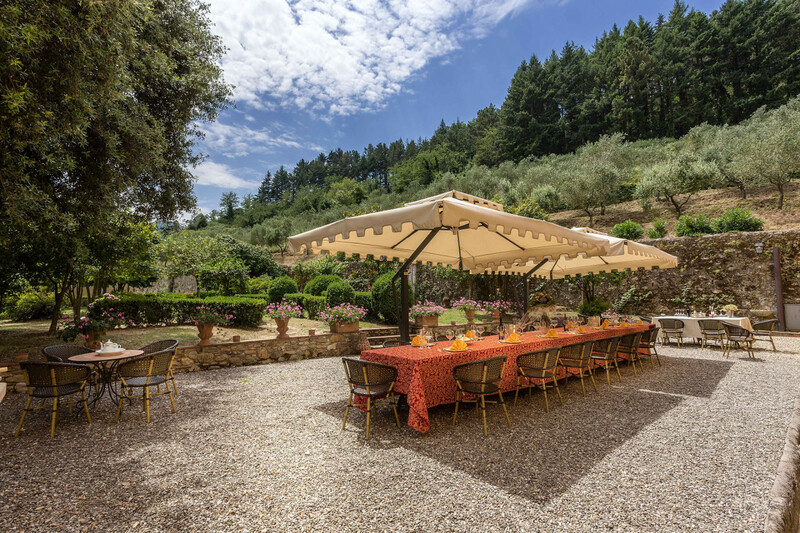 A nice walk through the centuries old trees of our beautiful Italian garden; a dinner under the stars in the magnificent alfresco dining area in the backyard of the Villa with an exclusive view of the olive groves and neighbouring villages: you will be spoilt by the choice! 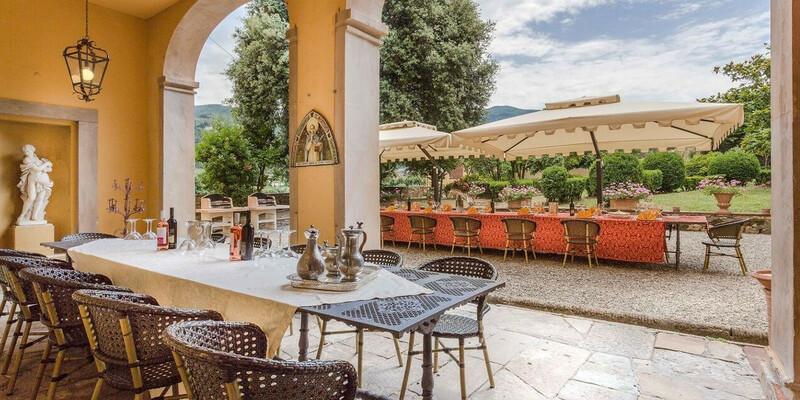 Under the arched loggia there is also another lovely dining area with BBQ. 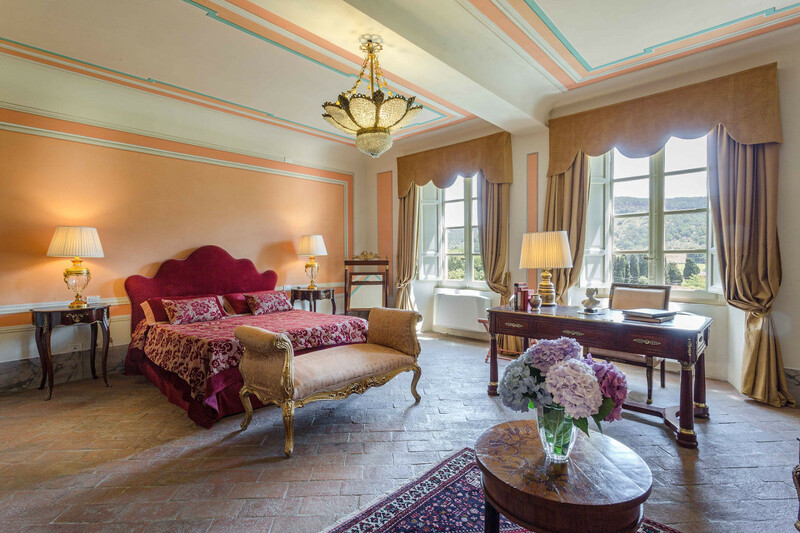 The three floors Villa offers eleven frescoed double bedrooms and magnificent en-suite bathrooms. 4 extra beds are available on request at extra charge. 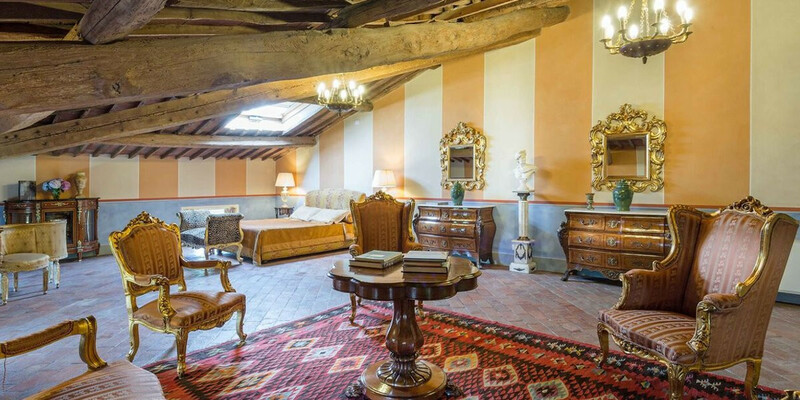 The ground floor features a majestic dining room for max 26 people and an elegant living room with Sat-tv and DVD player; two rest rooms; a laundry room with washing machine and dryer and a typical Tuscan fully equipped kitchen. 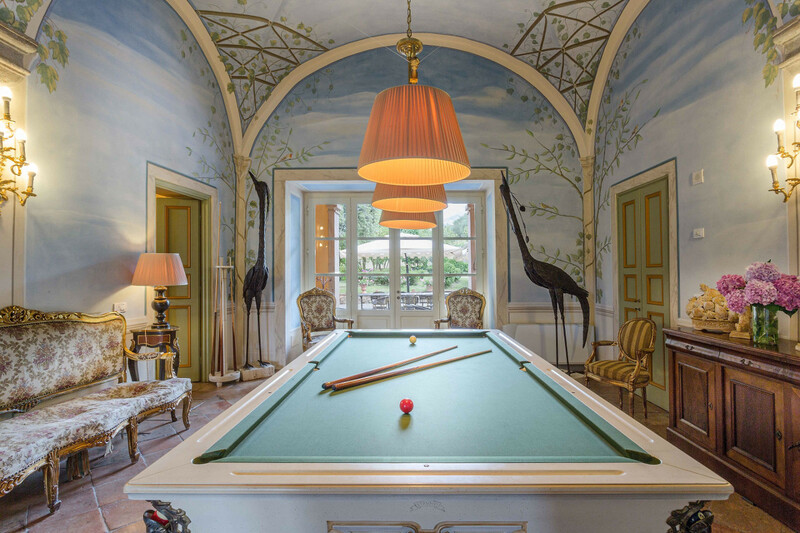 A billiards and a reading room are also at our guests disposal. 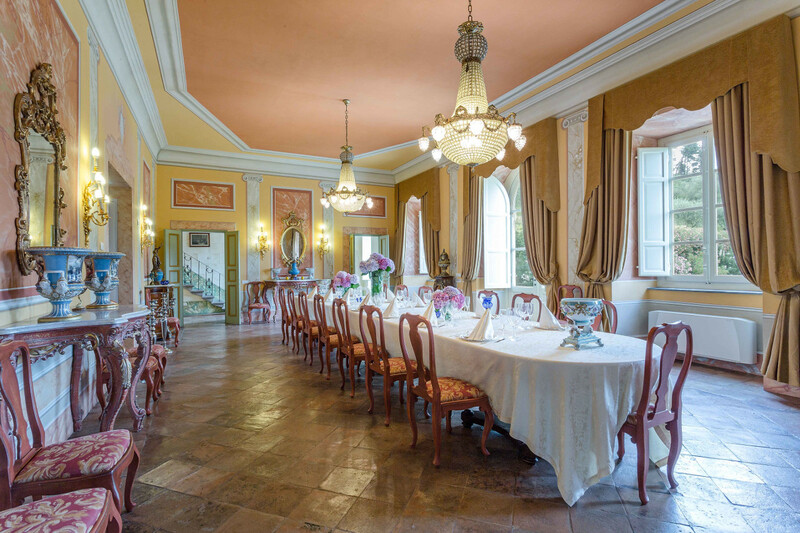 The interiors of this luxury Villa reveal its Old World heritage, from the glittering chandeliers and rugs to the paneling that lines the sitting and dining rooms. This aristocratic flair combines with modern comforts such as wifi, air conditioning and tv-sat for the ultimate perfect experience. 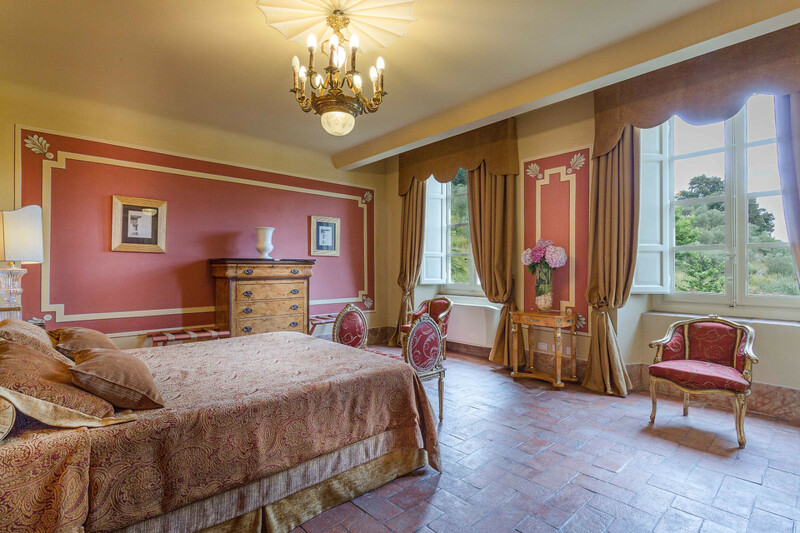 On the first floor there is a marvellous living room with murano glass chandeliers and beautiful views over the park of the Villa; an elegant studio and 6 sumptuous double bedrooms. On the second floor, a beautiful attic with wooden beamed ceiling will make you want to stay forever. 5 luxury refined double bedrooms (some with walk-in closet) with en-suite bathrooms are located on this floor.